I Survived! Join a thrilling adventure through time as we explore famous events in history. 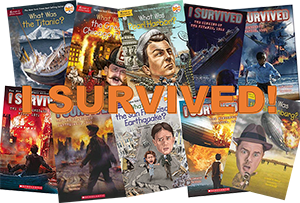 Students will read five titles in the I Survived series* followed by nonfiction selections covering the same topics. Assigned reading will be completed at home each week, and in class we’ll discuss the readings and further our understanding of these important historical events. Class discussion will include story highlights, new or unfamiliar vocabulary, fact versus fiction, character traits, and general historical context. Students will be responsible for completing reading assignments each week, so access to every book is necessary. As we will not mark in the books, borrowed copies are fine. *Content might be intense for some students. Please consider whether the topics and reading level are suitable for your child. Hi! I’m Stephanie DeYong. My family and I have been in Waco for 10 years and we love it here. We’re beginning our tenth year of homeschooling and our sixth year at Brazos Valley Co-op. I hold a Business degree from Oklahoma Baptist University, and in addition to teaching at home and at BVC, I teach ESL online. We are so thankful for the freedom and privilege to educate at home!